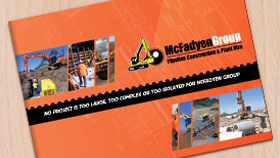 McFadyen Group - If you are looking for the most reliable heavy plant hire in Brisbane then you should consider the McFadyen Group. Call us for information and quotes. The McFadyen Group specialise in heavy plant hireBrisbane, and provide our customers with premium equipment that is modern and reliable. You can rely on us to provide you the right at equipment, at any place and any time. Our fleet of premium machines are made from reliable and trusted industry leading brands, so you can feel assured you are working with quality when you work with McFadyen. All of our machinery is kept to the best quality by regular servicing and inspections by our highly qualified fitters at our yard or your project site. If you would like to learn more about our services then feel free to give us a call for information or for a quote. Our friendly staff will happily answer any queries you may have either by phone or email.